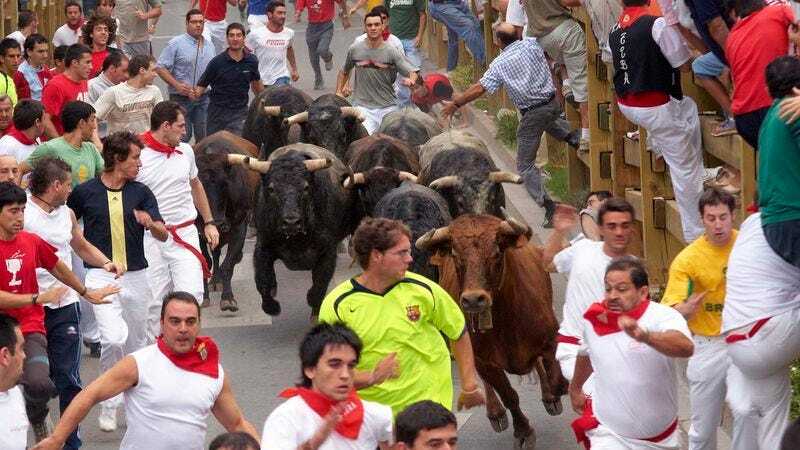 PAMPLONA, SPAIN—In a dangerous and completely coincidental confluence of events, three vacationing American movie characters were reportedly almost trampled to death when they just happened to pass through the center of Pamplona, Spain during the one week the running of the bulls takes place. “Say, where is everybody?” the film’s protagonist Paul Wallace said to his traveling companions as they stood alone in an empty and eerily quiet plaza, unaware that it happened to be the week of July 6, when the city celebrates its annual festival of San Fermín. “And why is the ground trembling? Maybe it’s an earthquake or—oh my God! Run for it, guys!” At press time, sources confirmed the three travelers had narrowly escaped the bulls, but only after running past the Leaning Tower of Pisa, Big Ben, and a group of lederhosen-clad Germans who were for some reason celebrating Oktoberfest.